At our last Racial Justice Allies dialog in July with the community, we talked about what to do as white people when we observe or are a witness to racial discrimination. 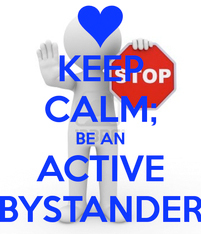 Bystander intervention is crucial now more than ever. Weekly we are hearing about stories of violent discrimination, verbal and physical, which exemplify the dire necessity for people to stand up and speak out. It’s good to learn and practice effective methods to de-escalate and counter-act the daily discrimination people of color face. It comes with violence; it comes in micro-aggressions, and it comes in many shades between. Particularly as white people, this a direct way we can begin to do the work necessary to create safer communities. The fight for justice is always intersectional and the tools are applicable in many situations of harassment. You are in a group of all white people and someone says “I really got a good deal, I jew’d him down.” What do you do or say? You hear a white person talking with a person of color and the white person says, “You are so articulate!” What do you do or say? You are in a majority white group of people with one person of color and when the person of color is introduced to an older white person in the group, the older, white person says “I’ve been meaning to talk with you about how you parked my car” and laughs. What do you do or say? You are ‘white’ and you are checking out at a grocery store and use a credit card and are not asked for picture identification. The female person of color ahead of you has used her credit card and has been asked for picture identification. What do you do or say? You are walking down the street and a 12-year-old boy of color is being called a (n-word) by a ‘white’ boy his age. What do you do or say? You are on a bus and notice a young woman wearing a hijab is being told by a young man to “get that scarf off or I’ll take it off”. What do you say or do and under what circumstances? 2 Responses to "Don’t Just Stand There, Do Something! Challenging Racial Discrimination." What’s going on? What do you need? This article was prepared by Dinah, Wendy and Nikki, who facilitated the July Dialog.